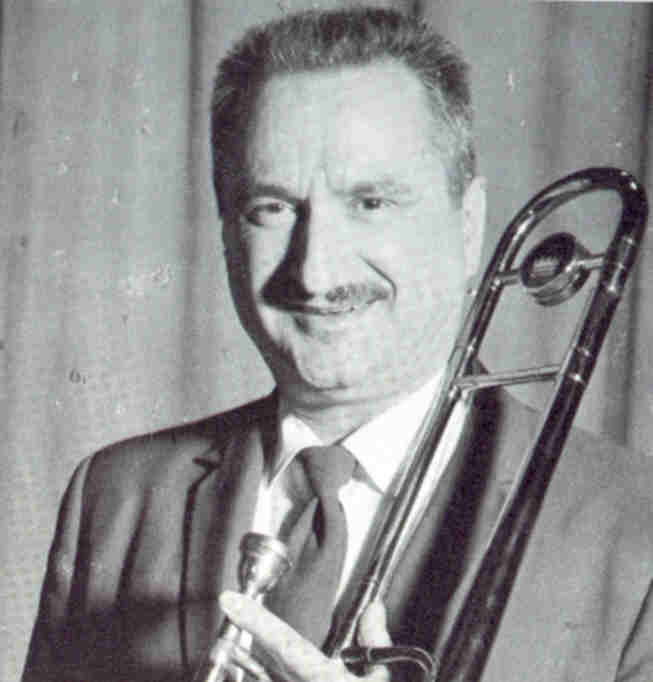 Kenny Trimble was a talented trombonist on the Lawrence Welk Show from 1957 to 1982. Trimble was born on March 1, 1919 and grew up in Milwaukee, WI. At 15, Trimble wanted a cornet that was priced at $8 in his local hock shop. But he only had $5, so settled for a $4 trombone and a $1 instruction book. He continued his studies at Milwaukee State Teachers College until he was drafted during World War II. After serving in an Army band during World War II, Kenny played with various bands such as Tex Beneke, Ray Anthony and Glenn Miller prior to joining Welk in 1957. From 1957 to 1966, Trimble was first chair and played alongside Barney Liddell, Pete Lofthouse and Bob Havens. Liddell moved from tenor bone to bass bone after Lofthouse left the Show in 1965 and Trimble moved from first chair to tenor bone after Don Staples joined the band in 1966. Trimble was married to Bonnie Trimble and had two children together. Trimble passed away in May 1991 of lymphoma.